The ancestor of all hammerhead sharks probably appeared abruptly in Earth's oceans about 20 million years ago and was as big as some contemporary hammerheads, according to a new study led by the University of Colorado at Boulder. But once the hammerhead evolved, it underwent divergent evolution in different directions, with some species becoming larger, some smaller, and the distinctive hammer-like head of the fish changing in size and shape, said CU-Boulder Professor Andrew Martin of the ecology and evolutionary biology department. Sporting wide, flattened heads known as cephalofoils with eyeballs bulging at each end, hammerhead sharks are among the most recognizable fish in the world. The bizarre creatures range in length from about 3 feet up to 18 feet and cruise warm waters around the world, Martin said. In the new study, scientists focused on the DNA of eight species of hammerhead sharks to build family "gene trees" going back thousands to millions of generations. In addition to showing that small hammerheads evolved from a large ancestor, the team showed that the "signature" cephalofoils of hammerheads underwent divergent evolution in different lineages over time, likely due to selective environmental pressures, said Martin. The team used both mitochondrial DNA passed from mother to offspring and nuclear DNA -- which is commonly used in forensic identification -- to track gene mutations. The researchers targeted four mitochondrial genes and three nuclear genes, which they amplified and sequenced for the study. "These techniques allowed us to see the whole organism evolving through time," Martin said. "Our study indicates the big hammerheads probably evolved into smaller hammerheads, and that smaller hammerheads evolved independently twice." A paper on the subject was published in this month's issue of Molecular Phylogenetics and Evolution. Led by former CU-Boulder ecology and evolutionary biology undergraduate student Douglas Lim, co-authors included Martin and University of South Florida researchers Philip Motta and Kyle Mara. Lim is currently a student at the University of Colorado School of Medicine. The National Science Foundation funded the study. The researchers sampled hammerheads from across the globe -- including the waters of the southeast United States now under siege by the Gulf oil spill -- as well as Australia, Panama, Hawaii, Trinidad and South Africa. Most of the hammerhead DNA was obtained at local markets, where the peddling of sharks and other fish is common practice. The team sequenced the DNA of the sharks, constructing a "phylogenetic" tree that shows how all of the species are related and when each species originated, said Martin. The hammerhead ancestor probably lived in the Miocene epoch about 20 million years ago. The team found that two divergent lineages of small sharks about 3 to 4 feet long originated independently at separate times in the past. One of the species, the winghead shark, now lives in the warm waters north of Australia and the other, the bonnethead shark, inhabits the Caribbean and tropical eastern Pacific Ocean. One reason for the "incredible shrinking shark" over the eons may be the process of neoteny -- the ability of some adult sharks to retain juvenile traits -- or their ability to achieve sexual maturity at earlier ages, Martin said. "As the sharks became smaller, they may have begun investing more energy into reproductive activities instead of growth." While the cephalofoils appear to provide "lift" to large hammerheads as they cruise through the water -- much like the wing of an airplane -- smaller hammerheads don't appear to gain an advantage in lift, but may gain other attributes. "It looks like they sacrifice locomotion advantages for prey detection and visualization," he said. Another advantage hammerheads may gain from larger cephalofoils is an increased number of electrical sensors in their flattened noses and heads that can detect extremely weak electrical emissions from molecules associated with potential prey. "Hammerheads appear to be able to triangulate on their prey, which is remarkable," said Martin. Small sharks are highly variable in the size and shape of their cephalofoils, said Martin. The winghead shark, for example, has a laterally expanded head that is about half the size of its roughly 4-foot body length. At the other end of the spectrum is the bonnethead shark, about 3 feet long but which has the smallest cephalofoil of all hammerhead species -- a protrusion that resembles the head of a shovel, Martin said. Martin said that hammerheads are an ideal biological study subject in part because of some important similarities to humans. Both have slow growth rates, mature late in life, give live birth and have relatively few offspring. While hammerheads may have a dozen or more pups, other oceanic fish regularly lay millions of eggs. Hammerheads generally live for about 30 years, he said. While hammerhead sharks appear intimidating, attacks on humans are extremely rare, said Martin. Hammerheads have relatively small mouths facing downward that are used to grab food like fish, shellfish, shrimp, squid, octopuses and stingrays. "If you see a hammerhead, I'd say grab your camera and jump into the water," said Martin. "Hammerheads are special fish, and there is nothing that remotely resembles them anywhere on the planet," said Martin. Unfortunately, hammerheads -- like most shark species -- are on the decline. In addition to being overfished, sharks often are the victims of a technique known as finning, in which fishermen catch them, cut off their fins for use in delicacy soups, and return them to the water to die, Martin said. Shark meat also is used for fertilizer and to make pet food. There currently are 233 shark species on the International Union for the Conservation of Nature's "Red List of Threatened Species," and 12 shark species are classified as critically endangered. 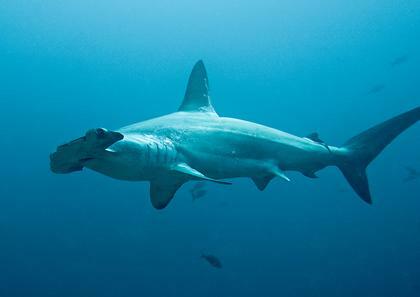 A study led by Virginia Tech showed the great hammerhead, scalloped hammerhead and smooth hammerhead species declined by an average of 90 percent from 1981 to 2005. "Their situation is generally pretty dire," Martin said. A 2005 study by Martin and his colleagues on scalloped hammerheads indicated females tend to breed in the specific ocean regions where they were born, while males tended to move around more widely. A previous study by Martin's team also showed that male great white sharks roam Earth's oceans much more widely than females, a finding with implications for future conservation strategies for the storied and threatened fish.